Shaving Factory Double Edge Razor. Not a bad piece for the money. 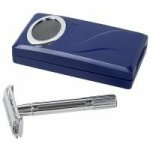 A nice twist to open razor that shaves better than the Weishi, we’d recommend it for the beginner.